Business 2.0 includes a cover story in their September 2007 issue (and on the web) about "The Next Disruptors". I've blogged about Zink a number of times starting at the Demo 2007 conference where they were a big hit, but it's also interesting that at last week's supplies confab, nary a word of Zink was mentioned, while the disruptive potential of both Eastman Kodak Company and Silverbrook Memjet were discussed at length. Extra credit? Read about the other 14 disruptors from outside P&I. HP (NYSE HPQ) has officially launched two new print-related blogs. 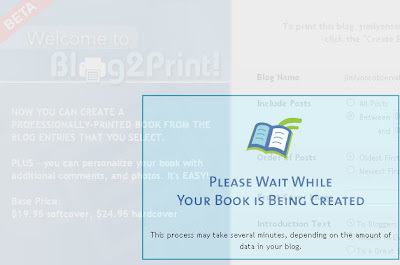 As part of today's Web 2.0 announcement, HP has kicked off one entitled "IPG Print 2.0 Blog". Interesting that it doesn't include the "print posts" feature introduced by HP in May? A welcome to the blogosphere is in order, but I'd suggest adding the print feature (as in "eating your own dogfood") and dropping the HP-insider-only acronym "IPG" from the title! I've used this blog and my print column a number of times to highlight the printer industry's fascination with small business (e.g. "Observations: The Year of Small Business" in May). Along those lines, HP has also launched HP’s Small & Medium Business Community Blog which promises to cover real user stories in this much talked-about space. Another hearty welcome to the blogosphere! I particularly like the recent feature showing "LaserJets around the world" which I think captures the interesting-but-still-fun aspect of blogging. In a media blitz that the company has come to specialize in, HP (NYSE HPQ) is back at the "Print 2.0" story that they started on in late May. They've added more new printer models to their story this time, which always helps with the printer and imaging press and analyst community. They are also offering a far-flung list of other print and imaging technologies and partnerships lumped under multiple headings. It continues to be a complicated story at the detail level, but the high point, at least judging by the headline of the press release, is the marketing campaign (HP Fuels Growth with Print 2.0, Launches $300 Million Global Marketing Campaign). A search of Google News, btw, finds a number of stories, though the 36 I locate with a literal search on "Print 2.0" is not bad but not a high number either. This probably speaks to the difficulty of conveying the story to the media, and thus the need to pull out the marketing checkbook and fill in a "3" followed by eight zeroes! HP's efforts, both in product and promotion, are truly of the leadership variety, and have at their roots an improved customer experience. I'll be examining the web printing aspect of this announcement in a later post and also as my September Observations print column. HP (NYSE HPQ) has received significant press and blog coverage from their discussion with John Markoff of The NY Times and his subsequent article on their "CloudPrint" initiative. Some of you may have already seen Richard Koman's excellent follow-up piece in TopTechNews, and I found a great complementary (not to be confused with complimentary) blog post by John Brian on Beaconfire Wire. While my views, as reflected in the TopTechNews piece, are coming from a printer industry-oriented customer perspective, Brian's views are more from the SMS/mobile phone/messaging view, and his run-through of the steps involved and speculation on the needs for this future service are well worth a read. By the way I will include more of my thoughts here in a blog post next week. One last post regarding the recently completed "Supplies-Side Economics" conference, and in this case I'm intending to mean the traditional meaning of "postscript" and not the Adobe Systems definition. During the analyst panel I've already blogged about, a persistent questioner at the very end of the panel (ok, it was me) attempted to integrate previous questions/comments about forecast risk, generational changes in printing habits, and trends in institutions transitioning to electronic processes from paper-based methods, and find out if they'd admit that somewhere there might be a downside for continued paper and supplies usage. Answers ranged from baby boomers still needing and demanding hard copy, to digitization driving more print to "the edges" via distribute-and-print forces, to changing applications taking the place of antiquated ones, but to a person, Lyra staffers Brewer, Forrest, Kasuba, and Lippman all held confident in their beliefs that paper and printing usage would continue to grow in the next five years at at least single-digit percentages. 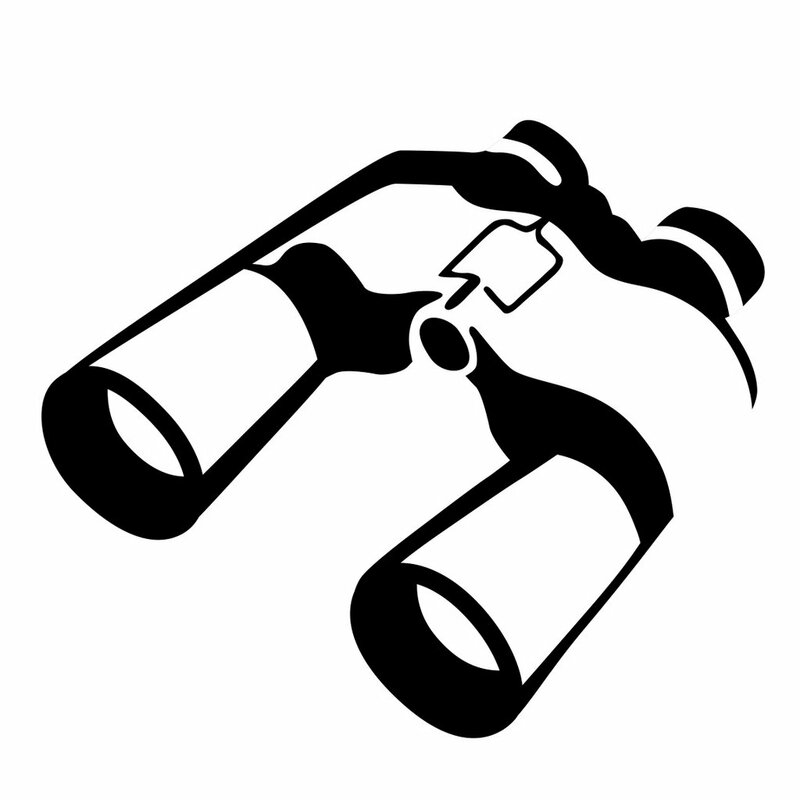 Recent readers of this blog and/or The Hard Copy Observer may remember I summarized some of my thoughts in The Changing Role of the Printed Page, my June 2007 Observations. I am a strong believer in the axiom of dramatic change often predicted long before it really happens (the demise of Dot Matrix printers and "the year of color" to name two from our industry) but when it finally comes, happening more suddenly than anticipated. As the WorldExpo trade show ramps up this morning in Las Vegas, yesterday’s “Supplies-side Economics” pre-show conference, presented by Lyra Research, is history and I will conclude my guest blogger status with this wrap-up. First off, what a great name for a conference about the printer industry’s supplies aftermarket! It’s based on a phrase that’s historically of interest (RIP Michael Deaver), not nearly as trite and overdone these days as something that includes “two-point-oh”, nor as painfully current as an attempt at tying in some way the phrase “sub-prime.” (Imagine “Sub-Prime Supplies”? -- too soon!). Second, can the one-day conference (a perfect length in mine and others’ judgement), combining insight from some of the industry’s brightest analysts and most savvy industry members, be summarized in just a few sentences in a blog post? It’s an impossible task, of course, but I’ll try. Borrowing heavily from William Chan of Ninestar Imaging, who kicked off the conference with an excellent opening presentation, the supplies aftermarket faces a myriad of obstacles as it looks to the future. These include the potential of smaller margins and disrupted business models (Eastman Kodak and Silverbrook/Memjet were frequently cited throughout the day); advanced technology from OEMs that challenges the industry with advanced chips and ink and toner formulations in the products, and IP in the courts; and distribution and other relationship and structural changes throughout the industry. The transition to a very strong color business on the laser printer further adds to the strain. BUT…the opportunity is a large one, very large, and ingenuity and drive will no doubt overcome the hurdles to continue to claim the 20+% market share and multi-billion dollar market the supplies aftermarket represents today. And last, thanks to Lyra Research, especially CEO Frank Stefansson and Marketing chief Andre Rebelo, for the opportunity to participate as official conference blogger. And my appreciation to the industry speakers already mentioned in earlier posts, as well as the afternoon’s industry representatives, including Chad Golden, Marketing-Strategic Planning Director, Static Control Components, Inc., Mike Andreottola, president and CEO, American Ink Jet Corp., Tom Kinneman, president, Image Polymers Company, Mark Mallgrave, sales manager for the Americas, Sensient Imaging Technologies, Inc. and Edward O'Connor, Esq., Partner, Trial Division, The Eclipse Group. O’Connor spoke about IP issues from his very strong base of experience and knowledge, and also mentioned his book, which I’ll plug here. It’s Intellectual Property Law and Litigation, 2nd Edition. Live Blogging "Supplies-Side Economics" conference -- Mid-day, a combination of Lyra Research printing and supplies experts took their turns reviewing the markets for ink and toner. Included on the agenda were the aforementioned Charlie Brewer, Managing Editor, The Hard Copy Supplies Journal, Andy Lippman, Industry Analyst and Program Manager for Ink Jet Supplies, Cortney Kasuba, Industry Analyst and Program Manager for Laser Consumables, and Jim Forrest, Senior Analyst, and they each had their turn and also appeared jointly in a panel where they all contributed their thinking to the threats and opportunities facing the business. Despite the difficult competitive environment that includes massive technological and business challenges, the prize is huge. As the Lyra history/forecast chart above shows, the supplies portion is the biggest part of the worlds' printing and imaging pie. I'm live blogging from the Lyra Research printer supplies industry conference in Vegas, and we've just reached the morning break. Despite some industry-wide issues facing the recharger business, as highlighted by opening speakers William Chan, Director, NineStar Image Co., Ltd., and Rob Leonard, President, Leonard Consulting, the conference is packed, and in fact was delayed briefly in its opening this morning by chairs being brought in to accommodate the additional industry members who wanted to attend. Charlie Brewer of Lyra concluded the early morning session and hit on two points worth expanding on later -- growth in the color laser supplies business driven by do-it-yourself marketing and other in-house applications, and the propensity for low-end color laser owners (in this fast-growing segment of the business) to perhaps upgrade to whole new printers, supplies included, rather than replacing supplies that are relatively costly compared to the overall price). Both of these topics have been covered in past Observations (the former more than the latter) and deserve further coverage soon. Stay tuned! I'll be in Las Vegas the next three days, first attending the Lyra conference where I'm the official event blogger, and then dropping in on The WorldExpo, the trade show for the print supplies industry. Speaking of dropping in, please check back here often for the latest from Vegas. A Greener Google -- virtual ink coverage? Example rates used in the HP studies were 60% for a typical flyer/brochure; a page of simple text is often calculated at 5% or less. Whether "virtual ink coverage" is real is beyond my scope but an interesting diversion in an event-filled week, to say the least! I've updated my table of printer-related results based on both HP's Q3FY07 earnings release and presentation materials. I've been tracking these for awhile and they include everything the company discloses, thus some gaps in the table. The $100 Billion "Printer Company"
Back in the late 1990's, the CEO of one of HP's (NYSE HPQ) key competitors in the workstation business loved to needle HP with what to him seemed to be the ultimate insult -- HP's really "just" a "printer company", implying that due to the company's dominance in the printer business that they weren't to be taken seriously as a full service IT supplier. Well, HP just announced results highlighted a blow-out top line, a $25B revenue fiscal third quarter. That's a 16% year-to-year growth rate, and with improved margins, EPS grew 37% on a non-GAAP diluted basis. Before I get too far out of my field of expertise, I'll get back to my printer analysis and be back with a post on some of the details but here's one high-level one to consider. Printer and imaging posted a healthy 8% year-to-year revenue gain, meaning the unit actually DRAGGED DOWN overall corporate sales growth. This is actually the third quarter in a row where the IPG sales growth rate was below that for the overall company, but never by such a dramatic margin. Wow! 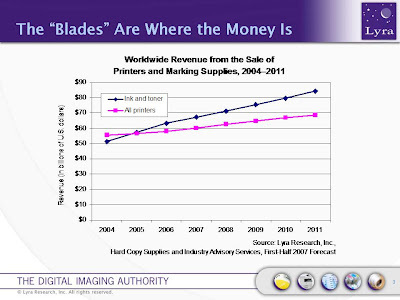 Lyra Conference coming up -- "Supplies-Side Economics"
"Printer OEMs are trying out a new strategy that could upend the razor-and-blades business model. The new strategy involves selling more expensive hardware and cheaper supplies, and it could have a dramatic impact on demand for aftermarket toner and ink cartridges. What will this mean for competing OEMs and aftermarket vendors who have long relied on low prices to attract buyers?." Stay tuned right here to this blog for conference highlights, in what has been a most interesting year! My Blog2Print Book is in! I posted just over a week ago about my experiences in submitting a custom book order to SharedBook based on content this blog, using the company's Blog2Print capabilities. And now the book has arrived! I must admit it's exciting to have this hard-bound volume of some of my recent musings, and I can't help but show off the book to friends and family, who all also seem genuinely impressed or are at least too nice to act otherwise. 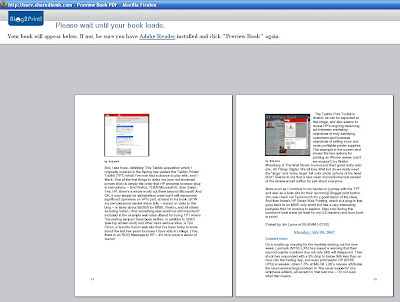 Part of the process involves the generation of a final "proof", a low-res PDF of the book that the user approves prior to order submission. As can be seen in the photo above it's a perfectly capable tool for final proof, and although the current version includes the addition of embedded graphics, a feature that I was waiting for to push me over the edge enough to be motivated to do my own book, there are still some pagination issues that were evident in the PDF, but not enough to hold me back from ordering the book. And, when the book came, wow, I was impressed, even with those spacing issues and a few other minor irritations. A couple of (inevitable?) small typos that I could live with in the on-screen version of my blog (and in fact, not even noticed in the proof), jumped out at me from the hard copy, making me cringe! But I'm not saying that's SharedBook's fault, just the interaction of my self-edited blog and the power of the (physically) printed page! Their service is in beta phase, and while some of us who use "beta" products like Gmail have come to expect near-perfection from "beta" versions, SharedBook admits there are a number of things they're working to improve, partly through gathering user feedback. Which, come to think of it, is just what "beta" is supposed to mean. While the widow-and-orphan improvements will be welcome, I did go ahead and order the book with "full disclosure" and thus am living with these imperfections. There was one issue I put back on SharedBook, and which they are making good on. I'd paid extra for a "suede" cover, and the book came with the more standard laminate hard cover. They're taking care of a refund on the difference in cost, and are addressing the issue in their ordering software. All in all, I'm quite pleased with the results from Blog2Print, and look forward to trying more books, as well as checking back in with Blurb to see how they're doing with a similar but not identical customer value proposition. And for you readers, have at it! You can print my blog as your own book by clicking on the Blog2Print button to the right! Thanks to Read/Write Web for a post yesterday about Amazon launching a service dubbed CreateSpace that competes with Lulu and allows users to create their own "...print on demand books, DVDs, CDs, direct download video, audio books, and HD DVDs (Blu-ray coming soon)". This space is adjacent to the print-your-own books endeavors of companies I've covered here such as SharedBook and Blurb, but I feel the self-publishing-for-commercial-sales market goes beyond the domain of this blog, which has been centered around home and office printing. But maybe I will need to re-think this definition? I really do not accept the title of this month's column as an absolute, except maybe in some cases and with a little explanation. I believe good ideas remain good ideas, even if they take forever to seemingly catch on. Thus the perception of old ideas seeming to come around again and again may be a function of market readiness and other infrastructure requirements that have not yet fallen into place. When these forces come together, however, the market may take off. This notion is related to another concept I have learned during my career (often as an evangelist for new ideas): repetition is okay and is often necessary to successfully communicate your idea, concept, or product. So when HP (NYSE HPQ) pushed Web printing as a major part of its annual spring printing and imaging conference covered in last month's "Observations", I had a major case of déjà vu (all over again, for Yogi Berra fans). In 1997, I led a team at my former employer to take advantage of the still-nascent World Wide Web and the print opportunities it presented. In spring 1998, HP announced Web PrintSmart, a software utility for Web users that provided an easy way for a user to automatically "collect" Web pages, format the content of the selected pages, and then print the pages (Observer, 6/98). This year, HP has not one but three Web-printing solutions, including a resurrected version of the 1998 product called HP Smart Web Printing, a blog printing service that promises to turn your blog into a print center, and the Tabblo Print Toolkit that is a suite of developer tools for making Web sites more printable. It is easy to be confused by HP's three offerings, even for those familiar with Web-printing applications. On one hand, HP is providing a vision and an investment in standards for the betterment of all involved with printing from the Web, including customers and fellow vendors alike. On the other hand, HP runs the risk of departing from the basic marketing principles of customer satisfaction, which I have been covering in one form or another in my "Observations" column the last couple of years. The supplies organization in HP’s Imaging and Printing Group (IPG) is sponsoring the firm’s current Web-printing initiative (as part of the company’s Print 2.0 amalgam). IPG’s supplies organization is measured by its ability to sell more supplies (ink, toner, and paper) this year than last year, so the group’s involvement with HP's Web-printing initiative has at least some industry observers questioning HP's motives. "Where the products went off base, especially HP’s Web PrintSmart (and maybe even more so its later 'Instant Delivery' software), was in their attempt to understand and to ultimately modify the behavior of Web information seekers. The idea of automatically scheduling 'harvesting' of Web content, to be pushed to end users’ printers, could be positioned as a great convenience for busy knowledge workers, but in reality, many users saw the process as a complicated hassle resulting in stacks of unread printouts. Basic printing improvements were crushed under the weight of these behavior-modifying (and supplies-business-building) 'features.' "
So maybe it is not just great ideas, but flawed ones too, that repeat themselves. Next month, I will take a more detailed look at the new HP Web-printing solutions and work at seeking out my favorite quarry—the great marketing principles of winning value propositions aimed at satisfying customers. My regular readers may remember back a couple of months when I referred to a blog posting by former HP (NYSE HPQ) colleague, Shane Vaughan, now of a young company in the Internet/advertising space (not to be confused with the Internet advertising space) named Balihoo. The Boise-based company and their aspirations were highlighted in the long-time "Bible" of the ad industry, Advertising Age just yesterday. I hope Shane will still have time to track creative printer ads after this new attention! The screens to customize seemed to require too much of a learning curve, so after a few feeble attempts I gave up on my attempts to customize the inside of my book except for changing the dedication (I was also hoping to reduce the size of some of the graphics and eliminate some of the widows and orphans). I did easily change the binding and cover options (to a fancy hard-bound suede model) and let the order fly, with a promised ship date of August 13th. So stay tuned for the unveiling of the physical model! Eastman Kodak Company's challenge to convert to life as a digital powerhouse took a major positive step today with its announcement of Q2 earnings. From a loss a year ago, EK beat the street with EPS of $2.06, on lower revenues. Their "traditional" business revenue decreased by 17%, so the digital business and its 3% growth couldn't make up the difference, and overall revenues were down 7%. Kodak's stock spiked over 5% on the news, closing at $26.93, which is still well off June's peak near $30 but a big lift from last week's trading under $25. Specifics cited in the news release include their claims of positive customer acceptance and expanding retail distribution of their EasyShare photo ink jet printers, as noted here last week.